After we’ve performed our free termite inspection in your Seal Beach, CA, home, we’ll provide you with an honest assessment along with an accurate estimate for treatment. If you use our services, you’ll receive numerous benefits that you won’t find with other termite control companies. For example, we use the innovative KILGUARD system, which completely eliminates all types of termites and prevents them from returning. What’s more, it does not involve noxious odors or fumes like standard fumigation methods. This means you can stay home without having to worry about your family’s health while treatment takes place. At Kilter, we’re so confident in the effectiveness of our termite treatment system and the skill of our technicians that we provide a two-year warranty. If you notice any signs of termites after treatment is completed, you can count on us to handle the problem quickly. 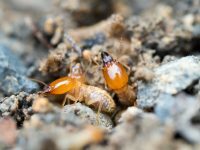 To schedule a free termite inspection at your home in Seal Beach, CA, contact Kilter Termite and Pest Control today.